Ferraria is an odd looking relative of iris which you see flowering with some fanfare in Australian gardens from time to time. It's a plant enthusiast's plant. 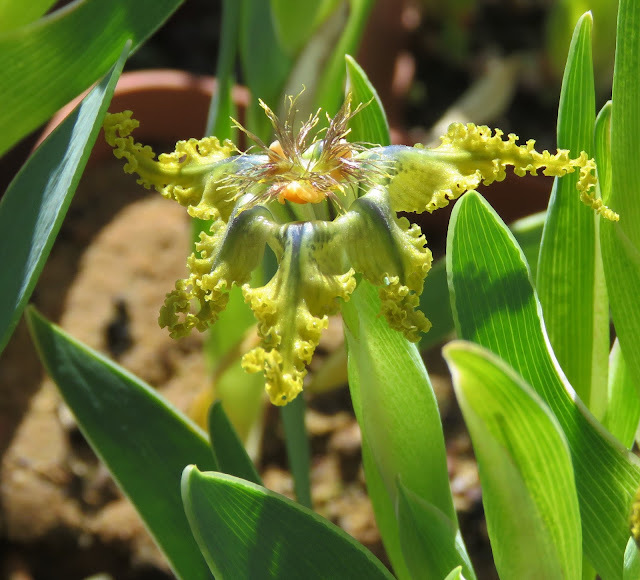 The most recent review of the genus Ferraria, in 2011, documents 18 species, proudly boasting eight more than the next most recent, in 1979. All species come from Africa, mostly in the south. Ferraria is easy to spot, when in flower. Look for crisped margins on the floral parts and a style (the receptive female part of the flower) divided into flat, forked branches with ornate fringes. These busy flowers are pollinated by a variety of bees, wasps and beetles. They have a corm, and leaves, like your typical iris, although the stumpy flowering stem is quite branched and leafy. Giovanni Batiste Ferrari published the first illustration of Ferraria in 1633, from a specimen growing in Italy. He was honoured by the genus name when it was described under the Linnaean system (which we still use today) in 1759 by Scottish botanist Philip Miller. The species illustrated here, Ferraria variabilis, is, like last week's, photographed from my visit to the Karoo Desert National Botanical Garden in August last year. 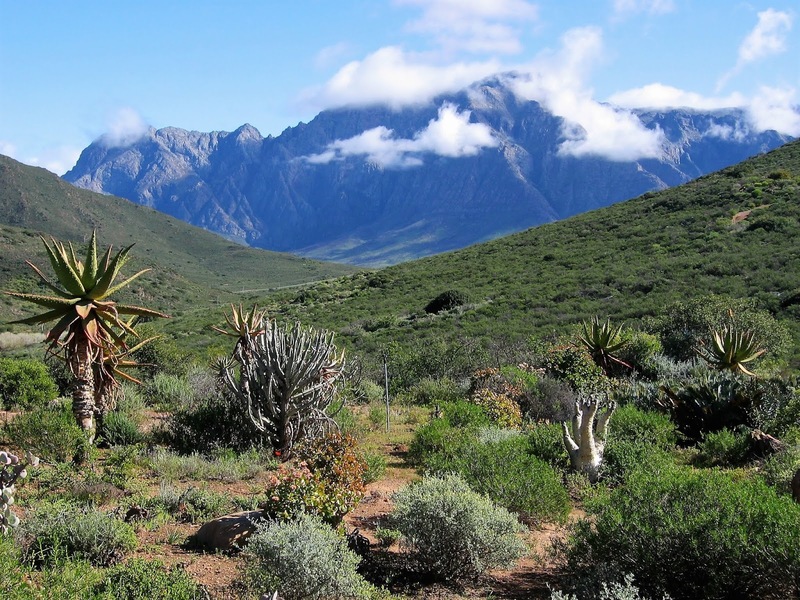 It occurs naturally in the south-west corner of southern Africa, from southern Namibia down the west coast to the Cape in South Africa, extending further inland in the north. It can be found on sand, granite or shale. 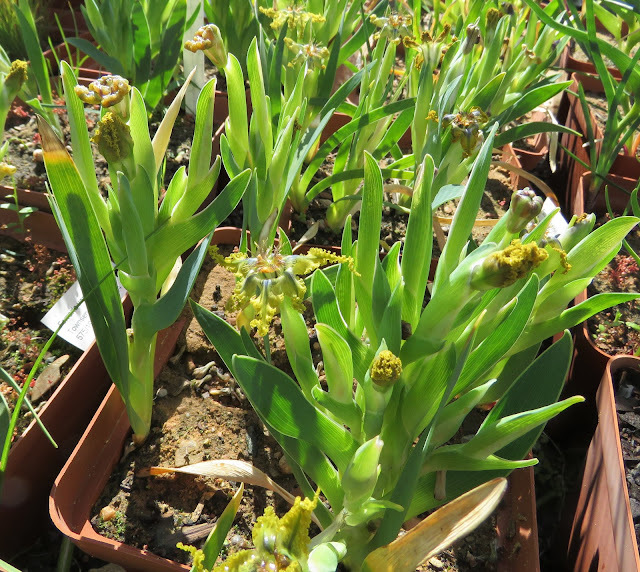 This is a relatively new species name, coined in 2005 to separate out a couple of varieties of Ferraria divaricata. Ferraria crispa, with blackish flowers, is more commonly grown in Australia and I've seen it described on Facebook as having 'an appalling stench'. Although this particular specimen has been cultivation since 1994, the flowers yellow colouring with a grey middle stripes seems to fit what is reported from the local area. 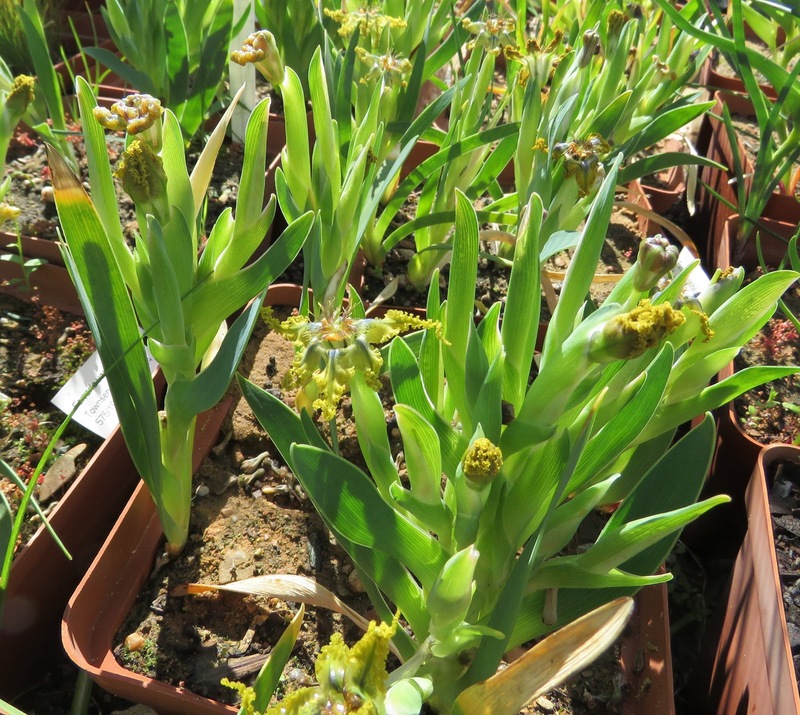 Flower colour varies across the range (hence the species name) but in the Karoo area the floral parts tend to be greeny yellow or brown, with a darker line down the middle and scattered spots. The flowers usually have a 'slightly putrid smell' although the perfume has been described as 'reminiscent of green olives'. All of which apparently makes the flowers attractive to pollinating wasps. I don't have any more pictures of the Ferraria so let me finish with another image of the Karoo Desert National Botanical Garden, this time looking out from the botanic gardens across to the neighbouring mountains.